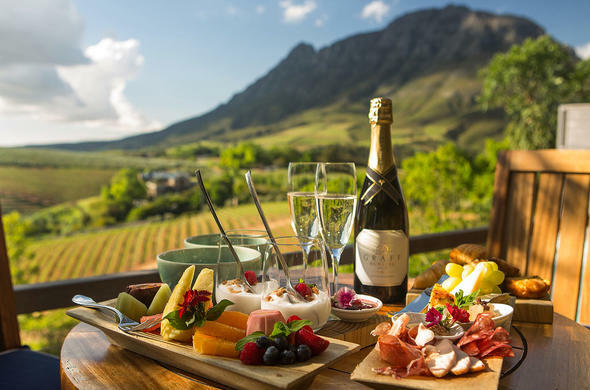 Delaire Graff Estate, a Cape Wine Estate hosts one of the leading restaurants and boutique hotels in an illustrious vineyard region between Stellenbosch and Franschhoek. Located between two premier wine districts, this Cape Wine Estate features superb accommodation, views, art, architecture, interior design, food and wine in one of South Africa's most extraordinary natural settings. Situated on the highest crest of the magnificent Helshoogte Mountain, this Cape Wine Estate offers exceptional dining options with indoor and outdoor flow, private dining and conference facilities. There are 10 secluded lodges in splendid gardens which showcase the works of leading artists. The creation of the buildings and surroundings were designed with the environment in mind and great care is exercised to ensure minimal impact and sustainability. The Delaire Graff Estate herb and vegetable gardens, along with local fresh seafood suppliers, artisan cheeses, poultry and meat producers, supply the kitchens. The Delaire Graff Restaurant offers fine food with fresh and vibrant flavours and beautiful valley and mountain views. Guests are able to dine under a canopy of pin oak trees on the terrace or within the spectacular interiors designed by the interior architect and decorator David Collins. Indochine Restaurant is situated at the Delaire Graff Lodge and Spa. Modern Asian Fusion inspired cuisine is presented with a contemporary flair and delicacy using produce mainly sourced from organic farms and the estate greenhouse. The interior design is elegant and intimate. Majestic views and al fresco dining can be enjoyed on the deck. Children of all ages are welcome at Delaire. A maximum of 1 child can share with 2 adults per lodge. Baby cots and additional beds are available for children under 12. Baby sitters can be arranged.